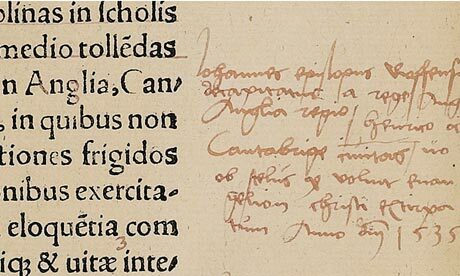 Sotheby’s has announced it is to sell an extremely rare and perfectly conditioned first edition of St Augustine’s complete works as edited by Erasmus. What makes the set of books even more special is the thousands of tiny red-ink corrections, amendments and commentaries, the majority of which have not been studied academically. What books–real or imaginary–would you like to see? I suppose the Necronomicon is the wrong answer? One of my big itches was satisfied when I got the facsimile copy of the Voynich Manuscript– I don't need originals! I'd really like a copy of the Codex Seraphinianus, though. Also I'd like all my mass markets to be upgraded to at least trade paperbacks. I always tell my wife that– a good present would be finding an international edition of all the SF & Fantasy novels that were only published as pulpy mass markets in the US. Ohhh & Centipede Press is doing this lavish, illustrated set of “The Book of the New Sun” which I desperately want but it is going to be like five volumes & each is $250 bucks & that is a bit too rich for my blood but Ohhhhh I want them. I'd have to go with the complete works of Sappho. Personally, I'd just like to not be allergic to the old books I already have. The complete Sappho–wouldn't that be a marvel? /Gumbo Cookery/ by G.B. Hall [my mom]. happily, this nonesuch book proved less than essential when, last christmas, my niece duplicated ma's file [FEElay] gumbo to a T [to an O?]. i had several hardcovers afflicted by mildew, which i suspect to be the culprit in your book allergies. the good news: i cured my troublesome volumes [/the red men/ by patrick mcginley, a slipcased lucius shepard, and /starboard wine/ by samuel r. delany] by sealing them in ziploc bags. the bad news: i left them sealed for four years. and the mold problem is likely to recur, depending on the humidity and spore-count of your home/library. good luck. The Venomous Bede?! Hmph. I used to have the standard Penguin edition of Bede, but don't know if I still do. Personally, I'd like to see any of the lost Greek plays–we have such a tiny random fraction of them. Ed, all our old pulp ppbs are in plastic, following your suggestion years ago. I sleep better for it. –P, oooh, yes, Greek plays! Ed — I've put a tiny portion of them in barrister's bookshelves, but once they're sealed away, you can't really enjoy them as anything more than decoration. If I can't touch and read and enjoy them, I might as well read them online, or check them out of the library, or get a Kindle or iPad. Nothing as old or erudite as your list but I would love to see my own copies of the Dumas books I read as a young girl. Of course who knows where in the world those things are today. Sly who loved the swashbuckler books as a young reader. Though I read a lot of other sorts of things now I still love lots of action. I just watched The Count of Monte Cristo with Mel last night. The 2002 version with Richard Harris, Jim Caviezel, Guy Pearce and the lovely Dagmara Dominczyk. It resides in my DVD great big disc album with tons of other movies. Sly who can't figure out how not to be anonymous on this site. I just have to agree with you about Bede, personally. Although I wish that the old Germanic poetry written down in Charlemagne's era had survived. Sigh. That would have been something, too. Yep.